On page 128 of LOTD I mention the "Cambrian Explosion", a term sometimes used to describe the sudden appearance of many modern animal phyla in the Cambrian period of the fossil record. The Cambrian layer was discovered in Darwin's time, indeed, the geologist Adam Sedgwick, who named this period, was one of Darwin's teachers. Darwin believed in gradual evolution, and was disturbed by the apparent speed of evolution in the Cambrian. Indeed, even today Creationists (those who believe species were created by a supernatural agent) cite the "Explosion" as proof that species could not have been generated by evolution. in Science . It is just the latest in a long series to modify the idea of an explosion in evolution. 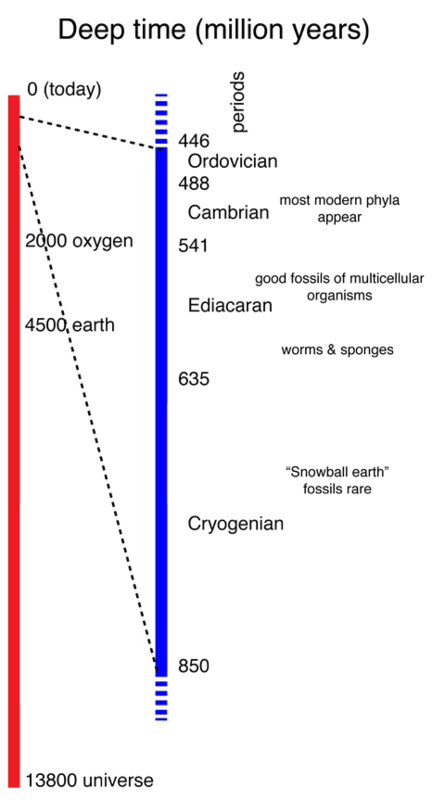 On the right is a time line that may put the Cambrian in perspective. The beginning of our universe is largely determined by the characteristics of the cosmic microwave background radiation, which is known within a few percent. The time when our planet earth formed from fragments of the disc around the early sun is also known within a few percent from isotope ratios. The early earth was not a pleasant place to live. It was hot, there was intense volcanic activity, and the surface was constantly bombarded by meteorites and intense u.v. irradiation from the sun. The u.v. intensity alone would have made evolution of life on land improbable. However, after about 500 million years bacteria-like cells began to grow in the ocean, and 1500 million years later organisms evolved that could use sunlight for energy. A by-product of this inovation, photosynthesis, was the production of oxygen. Some of the oxygen in the atmosphere was converted to ozone, which screened the earth's surface from most of the sun's u.v. Oxygen also allowed animals to evolve that had high metabolic rates and larger sizes. What does the recent article say? Here is a brief quote from the abstract: "... the major animal clades diverged many tens of millions of years before their first appearance in the fossil record, demonstrating a macroevolutionary lag between the establishment of their developmental toolkits during the Cryogenian...". The "developmental toolkit" referred to above is the set of genes (and of course the proteins coded by these genes) needed for development of complex organisms. One of the revelations from "evo-devo" research in the last few decades [see pg 133 of LOTD] is that the genes needed to specify complex morphologies in are but slight modifications of genes present in "simple" single cell organisms. To go from a yeast cell to a fly you only need to make multiple copies of a few key genes, introduce a few mutations in each of the genes, and evolve a regulatory system to express the genes in the correct order. I'm simplifying things a little, don't go out and try to make a fly without further instruction, but that is the basic idea. The overall take home lesson is that the appearances of many complex organisms in the Cambrian period is not so sudden or so mysterious as it seemed in Darwin's time. The difficult and time consuming evolutionary progress of developing the basic genes took place before the multicellular organisms evolved. To understand the Watergate burglary it was necessary to "follow the money". To understand biology, at least in a deep way, you need to follow the biochemistry (or molecular biology, what ever you want to call it). You don't have to read and understand a 1000 page biochemistry text now, but you should try to gradually nibble around the edges. Several months after this essay was published, a report  of trace fossils found in Uruguay and dated to greater than 585 million years ago was published in Science. Trace fossils are typically impressions of organisms in mud or clay. They can be foot prints of early hominids or more modest and vague tracks of animals. In this case the fossils were tracks of animals that burrowed in the interface betreen bacterial mats and mud. There is sufficient detail that the authors infer that the burrows were made by animals with bilaterial symmetery. This pushes back the time of first appearance of the ancestors of the animals that appear dramatically diverse and numerous in the "Cambrian Explosion".